In keeping with the last two years, I plan to post short recaps of each of this year’s twelve dinners here, with a slideshow of photos. Orlando’s cooking career began, in the coastal kitchens of his home state of California, merely as an accessory to a life of snowboarding and skateboarding. Since then, he has recorded some meaningful time in two celebrated kitchens. He spent three years cooking at Per Se in New York (straddling both Jonathan Benno’s and Eli Kaimeh’s tenures). And, more recently, he spent five years in the kitchen at Noma in Copenhagen, where I first met him in February, 2013. It was his last week at the restaurant as chef de cuisine, and it was his day off. So he came in and joined my friends and me for dessert at the end of our meal. He told us about his own restaurant, which he opened later that summer in a nearby warehouse. As in past years, Paolo Lucchesi at the San Francisco Chronicle will be interviewing all of the chefs cooking at this year’s Twelve Days of Christmas. You’ll find his interview with Orlando on his blog, Inside Scoop, where Orlando briefly described his approach to his collaboration with Kostow for this dinner. Quite a few of Orlando’s dishes at the Twelve Days of Christmas were adapted from ones that I had at Amass, like aged carrots encrusted with crispy bits of caramelized yogurt; and potato bread served with a spicy, vegetable condiment (at Amass, the condiment was made from pickled cabbage; at the Twelve Days of Christmas, he used kale and Calabrian chiles). 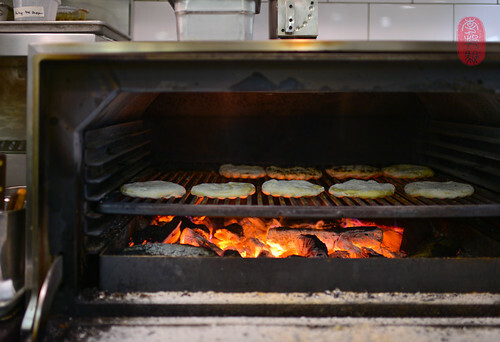 The bread dough, made from fermented potatoes, was formed into thick discs, quickly grilled to set the shape, brushed with butter, and finished in the oven. The bread was quite dense, but very moist on the inside. The outside was dusty with char marks, with a slight hint of smoke from the grill. Served warm, it was incredibly comforting. Instead of pork neck and apples under a canopy of kale, he served venison with pears topped with a rainbow of chard. And adapting my favorite dish from my dinner at Amass to the ingredients available in Napa Valley, Orlando switched out crosnes* for aged beets in a dish that also included dried plums, warm almond oil, and a dusting of black limes. As with the original, this dish was was an phenomenal meeting of flavors and textures. At Amass, I had a terrific salad of lettuces with “croutons” made from compressed layers of chicken skin. At this dinner, Orlando tossed those chicken skin “croutons” with chopped scallops to a make a delicious filling for a “dolmade” wrapped in young, tender beet greens. This was served as a canapé. 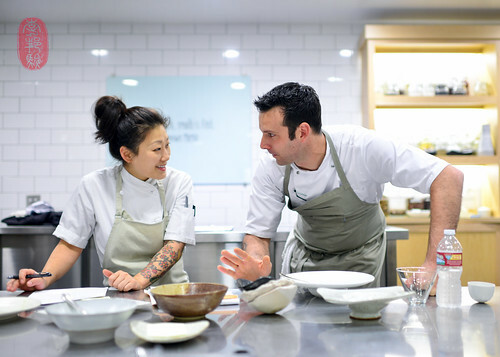 Kostow’s team presented two canapés and three courses, two of which put twists on skin. 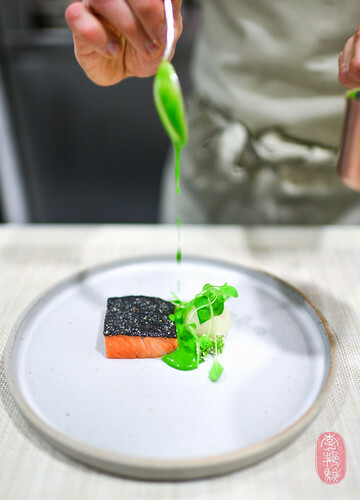 One dish presented a gorgeous piece of cured sea trout with a super-crisp “skin” made of buckwheat and vegetable ash. The fish was served with a baby turnip and a creamy sauce made with turnip tops. The other dish featured slices of beautifully cooked roulade of guinea fowl stuffed with black truffles. 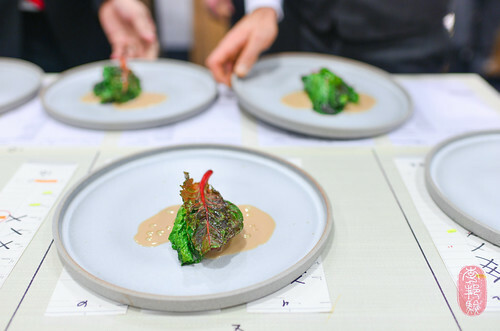 The hen was wrapped in a thin sheet of yuba, and then fried to crisp the tofu wrapper to mimic the fowl’s “skin.” The slices were blanketed with paper-thin coins of king trumpet mushrooms, and drizzled with a rich reduction of guinea jus. 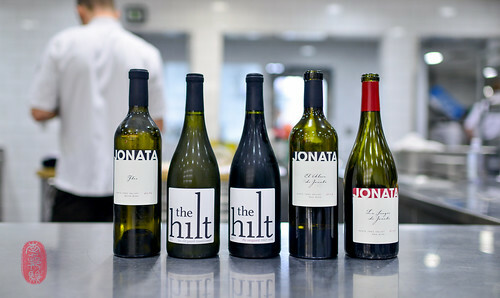 Below, you’ll find the menu from the first night of the Twelve Days of Christmas with Matthew Orlando, with wines by Jonata and The Hilt. Following the menu, you’ll find a slideshow of all of the photos that I took at this dinner. Sunchoke purée, trout roe, and sea lettuce. Buttermilk, pickled Douglas fir, sour curd. Red seaweed, plum, almond oil, and black lime. Fried candy cap, chestnuts, and cep oil. * Orlando told me that the original version of this dish that I had at Amass was created rather spontaneously, when his gardner’s successful experiment with growing crosnes yielded a small batch, only enough for about 20 portions. ~ by ulterior epicure on December 8, 2014.